Eliminate the hassle of bottling and put the fun back into making wine at home. You get everything you need in this one package to say goodbye to bottling! Once you start kegging you will never look back. Using a keg saves you time and eliminates possible contaminations by using fewer containers. You'll have no more hassle of sanitizing bottles or applying caps or corks. One of the best features is being able to carbonate your wine quickly, without a bunch of Champagne equipment! You will enjoy drawing your own wine from a keg and serving it to your family and friends. Plus, you're no longer locked in to finishing the whole bottle once it's open. This system is designed to include absolutely everything you need to dispense your homemade wine on draft. With the dual gauge regulator you can tell what the pressure is in the keg, as well as what is left in the tank. It also features a knob on the regulator so you can adjust the pressure without a screwdriver. The keg has been cleaned, gaskets have been replaced, and will come pressure tested. We still recommend sanitizing your keg before use. The CO2 tanks are shipped empty. You can have them filled at a welding supply shop or see your Yellow Pages under Gas- Industrial, Medical. Note: This home wine draft system comes with PIN LOCK fittings. What is the difference between pin lock and ball lock kegs, and which is better? It is just a style difference. I prefer the pin lock, the kegs seem to be cheaper due to the extreme number of retired syrup containers. It depends on your location and availability of kegs. The ball lock is what you remember from keg parties, the pin lock is Coke syrup containers before they went to boxed syrup. Hope this helps a little. Start kegging. Start today. You will not regret it. My one recommendation is to source out where you will have the CO2 tank filled ahead of time. It's no fun getting this system home and not being able to use it because you have no gas to power it. Whether it's pin or ball, this keg starting pack is great. The lines are the perfect length to avoid foamy beer or a backup of fluid into the regulator. The gaskets and poppets are new and in great condition. I actually lucked out and received a lid with a pressure relief valve (YMMV). On that note, if you don't have a place nearby that will fill tanks (i.e. will only exchange), you may want to just purchase the equivalent parts sans the CO2 tank and purchase the first tank from your local distributor/LHBS. The only problem with this kit as far as I can tell is that you will need more kegs and a dedicated fridge for your beer once you get it! This was the kit that I used to start kegging and it has served me well. All parts of the kit have performed perfectly through several kegs. One of the best investments that I've made since I started brewing. Set up had everything needed to make the jump to kegging,haven't look back since.Been using without issue for over 2 years now. I was afraid to get into kegging as all my friends kept complaining that they always forgot to get some part or gadget when they went to the store. This kit makes life really easy. Everything that is needed to start kegging comes in the box. One small detail that sometimes is not clear is, you will need to be able to bring down the beer to a "cold" temperature if you wish to force-carbonate it. You can also prime the beer with sugar just like you would in bottles if you don't mind a little sediment in the first couple of pours. Draft home brew such a great thing. This keg starter system really saves so much time and puts the enjoyment back in home brewing. It can be very tedious cleaning bottle after bottle but with this keg and co2 set up clean only one vessel and enjoy your beer sooner with forced carbonation. This was a great setup for me to finally move into kegging! The keg was in good shape and the CO2 tank and regulator were good quality pieces. The bad news for me is that I have to exchange tanks at my local gas distrbutor, so I came out with a less attractive tank. I definitely recommend this kit! Arrived a day earlier than expected thanks to MoreSaver shipping. The interior was clean and in great condition and I had a lucky bonus - the lid came with a release valve! One minor issue was that all of the fittings for the CO2 assembly and faucet were a bit loose when arriving. I thought I'd caught them all, but ended up with a bit of unexpected pressure loss and beer sprayed. Great set up. I got so fed up with bottling. In my opinion it pays for itself the first time. No more hassling with sanitizing bottles. Woo Hoo! This is a great way to get started kegging beer. You will save a ton of time in bottling once you make the move. Now I just bottle what I want to give away, or age. What a time saving! It works great, wish I would've done it a long time ago. This is a great starter system for any one who wants to get into kegging for the first time.Impress your freinds too! Draft home brew such a great thing. 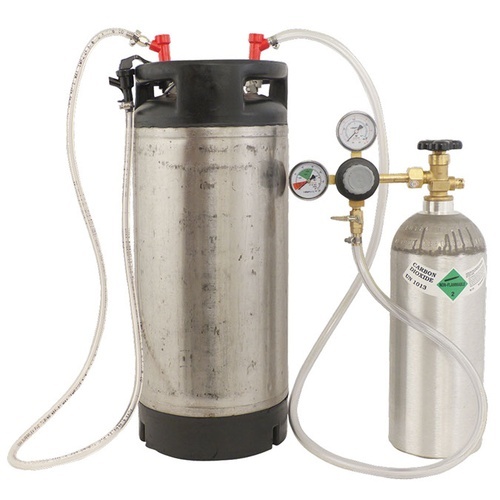 This keg starter system really saves so much time and puts the enjoyment back in home brewing. It can be very tedious cleaning bottle after bottle but with this keg and co2 set up clean only one vessel and enjoy your beer sooner with force carbonation. Perfect starter system, as it does what it is supposed to do; dispense cold, perfectly carbonated beer. Easy to set up and use, and portable as well. I would definitely recommend. I got this for about $160 including shipping, and it is still going great. I like the knob on the regulator that lets me adjust the pressure without a screwdriver. I got everything I needed in this one package to say goodbye to bottling. Nice starter setup at a very good price.